Giant morsels of sustainable chocolate grown in the Peruvian Andes, milk, semisweet and dark coins, in cookie dough of all butter, pure cane sugar and cage free eggs. Caramelized chewy-crispy-edged wonder. Non GMO and additive free. 40 per case, 3.02 oz. 40 per case, 2.88 oz. 40 per case, 2.94 oz. Dark, amber caramel is mixed with fresh whipping cream and butter. Itâ€™s blended into a graham crumb crust, folded into a layer of cheesecake batter and then salted and dolloped on top. BrulÃ©ed for a golden caramelized edge. Sweet Street's sophisticated New York cheesecake custom tailored for the individual. Creamy and smooth with the velvet tang of cheese, and a shimmer of vanilla bean glaze. Individual portions of nearly flourless Dark Chocolate Truffle filled with Ganache (Heavy Cream & Chocolate), which when gently warmed, makes its own delicious Chocolate Sauce. A traditional, luxurious Italian dessert consisting of alternating layers of imported Mascarpone and Ladyfingers soaked in Espresso with a hint of liqueur. 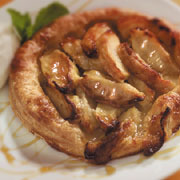 This handcrafted apple tart is five inches of buttery, flaky French puff pastry. Fresh, ripe apples are layered and baked to a golden brown. Ready to use. Sweet Street's creamy caramelized sugar crÃ¨me brulee layered top and bottom with buttery salted caramel. 48 per case, 4.16 oz.